The movie opens with Robert De Niro getting into a car that explodes once the key’s in the ignition. 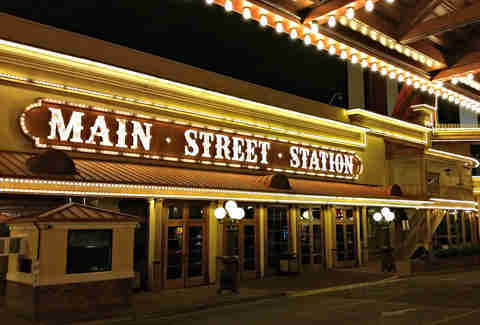 The scene was filmed in the parking lot of Main Street Station with the California Hotel & Casino in the background, and they had to blow-up at least three cars before they got the shot just right. De Niro's character is based on Frank “Lefty” Rosenthal, and yes, he survived a car explosion in real life, but it happened back in 1982 outside the now closed Tony Roma’s on Sahara. Sharon Stone plays De Niro’s drugged-out wife and there’s a moment in the film where they argue about her spending habits over dinner. It was filmed in what is now Oscar’s Steakhouse at the Plaza Hotel. At the time it offered a clear view of the iconic lights on Fremont St, but that view is mostly blocked now by the eyesore known as the SlotZilla zip line ride. Remember when Joe Pesci stabbed some jerk in the neck with a pen? 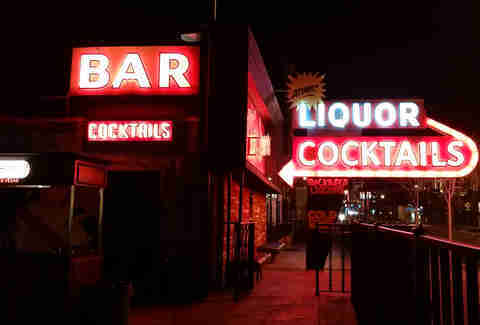 That scene was filmed at Atomic Liquors, which is one of the oldest bars in Vegas, and although it wasn’t based on a real-life event, it actually inspired by a prison fight witnessed by Cullotta while behind bars. Cullotta owned the Upper Crust Pizzeria, which was a front for a mob hangout back in the day. It’s no longer around, so Scorsese chose to film some dinner scenes at Piero's instead. 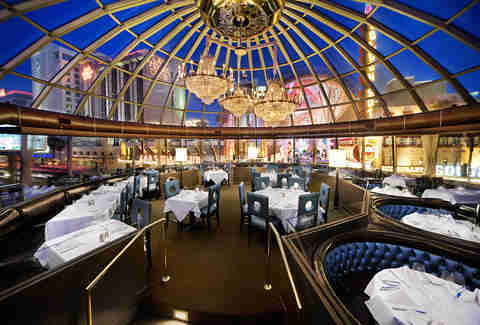 The Italian restaurant remains a popular reminder of old-school Vegas and was called The Leaning Tower in the movie. By the way… the original pizzeria did such good business, Cullotta says he was almost tempted to go legit. Almost. Pesci’s character is based on real life mobster Tony “The Ant” Spilotro. His gang was captured while trying to break into the safe of Bertha’s jewelry shop by going in through the roof. The FBI was watching but had to delay its bust when the mobsters missed the safe by a few feet, forcing the agents to wait until the burglars actually stole something. 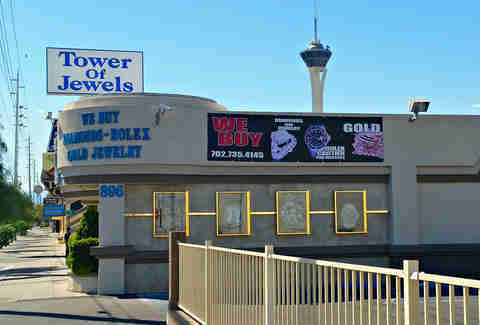 Bertha’s is still around but is now known as Tower of Jewels. 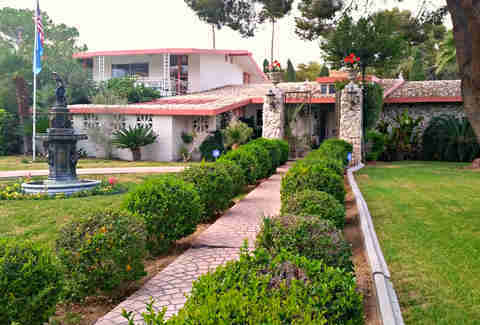 The home of De Niro’s character is a retro throwback that’s still around and visited on a regular basis by mobster tours. The guy who owns it will often come out to answer a few questions about the filming. Just be polite… and nobody gets hurt. 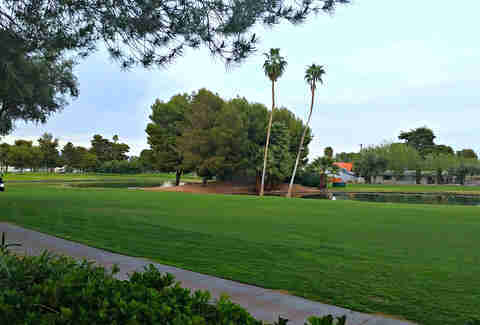 There’s a moment in Casino when FBI agents land a plane on a golf course after running out of fuel during surveillance. It actually happened, but in real life, the plane landed in a pond on the course. The agents panicked and thought the plane was going to sink… before realizing the water was only a few feet deep. 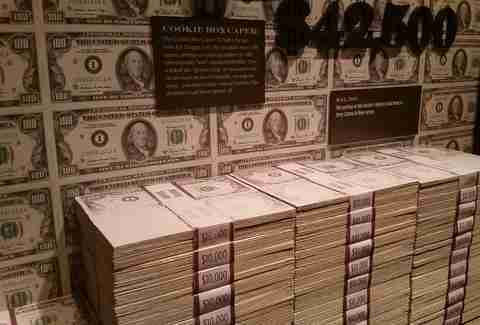 The tour also includes a few hours at the Mob Museum, which by itself is one of the best tours you can take in Las Vegas. It was originally a federal courthouse and used as a filming location in Casino for that purpose. One of the current exhibits takes a close look at the skimming scandal that plagued the Stardust and Flamingo casinos, where money was secretly stolen or “skimmed off the top” for mob figures back in the Midwest. The exhibit actually shows clips of it being done in Casino since the film so accurately captures how it happened. So what about the actual casino that’s featured in the movie? 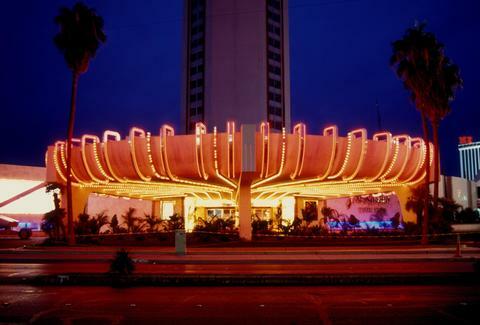 The exteriors of the fictional Tangiers were shot at the Landmark Hotel… which has since been demolished. 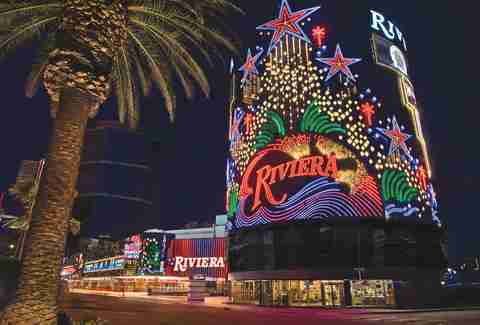 But the interiors were filmed at the Riviera, which is still around… for now. It’s closing on May 4 to make room for an expansion to the Convention Center.